Home » Is Gold Investment Risk Free? Is Gold Investment Risk Free? Like any investment, there is a certain element of risk that comes with investing in gold. Although it is safer than many other investments, there is always the danger that either demand or value could fall, and there is often no definite way of knowing when it could rise again. Gold is thought of as a safe haven for many investors and many financial advisers recommend that you store a percentage of your wealth in gold – usually between 5 – 20%, however you shouldn’t be misled by claims that gold is 100% risk-free. that it has the ability to hold its value over a long period of time, hence the reason why some people consider it to be risk-free. This reputation is based on centuries of performance results indicating that gold prices tend to go up in times of economic instability or political unrest. There is no guarantee that this will continue to be the case in the future, however, and there is always the chance that substitute investments for gold will become more popular. As a tangible asset, gold will always have some sort of physical value, but investors should be aware of the risks and be aware that it is not entirely risk-free. A good example of the risks involved in gold investments can be perfectly demonstrated by what happened after gold prices hit a peak in 2011. Following the financial crisis in 2009, the value of gold went through the roof. In the Autumn of 2011, gold prices had reached nearly $2000 dollars an ounce, an increase of over $1000 in less than two years. Today gold prices have dropped to around $1,260 so if you’d bought gold at its peak value in 2011, you’d have made a considerable loss. It might be years, if at all before gold prices reach those sorts of heights again. Like any other valuable commodity, gold needs to be stored securely in order to prevent theft or damage etc. If you’re storing the gold yourself then you need to ensure that it is properly stored in a safe or other suitable storage solution and that you are properly insured should anything happen to it. If your gold is being stored by a third party, then you need to make sure you know your rights with regards to ownership of the gold should the company fail or go bust. With an allocated gold account, the gold belongs to you even if the company responsible for storing it goes bust. However, you should always check whether the company are contractually obliged to lend your gold out to anyone. If your gold is stored in an unallocated vault and the company goes bust, then you wouldn’t have legal ownership of the gold as it doesn’t physically belong to you. You would instead only have legal rights as an unsecured creditor. There’s a huge amount of gold dealers about these days, the vast majority of which are perfectly respectable, however, there is always the risk that you could be defrauded, particularly when purchasing gold from online sellers and on rogue websites. 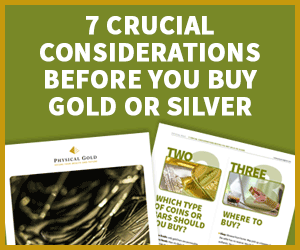 Before investing in gold, you should always make sure you shop around and get an idea of prices as well as carrying out your own market research. This way you can minimize the risks and avoid being ripped off. A reputable and honest dealer will steer you towards the right investments for your requirements and not push you towards purchases with high mark-ups. Here at Physical Gold, we have nearly a decade of experience aiding clients in expanding their gold portfolio with tax-efficient and secure solutions. We can supply a range of options helping you to diversify your investments and create a well-balanced portfolio. Please contact us on 020 7060 9992 for more information.